This map depicts Spitsbergen/Svalbard, rather than Greneland (as stated on the map). It reflects the name given by English mariners to the island. It is based on the cartography of Captain Thomas Edge. 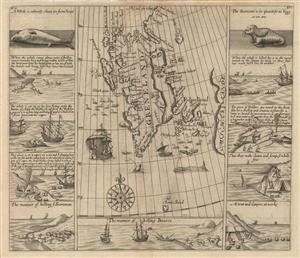 Ten pictorial vignettes flank the map, depicting scenes of walrus hunting and whaling. These vignettes are taken from the watercolours produced by Robert Fotherby, an English Explorer and Whaler with the Muscovy Company. Strong impression.